Ice is very slippery. I think figure skating fans all know this fact but it was never more apparent to me than on this sixth day of competition. I saw some amazing, but also some surprising and sad things at the arena on what turned out to be our longest day at Little Caesars Arena. The biggest takeaway I got from today is that one element can be the difference between first and fourth place. Let me back things up a bit and take you through day six of my adventures in Detroit at the U.S. Championships. My day started off with the first two groups of pairs skating their long programs in the senior pairs final. The very first team that took the ice had some lift issues throughout their long program and what I didn’t realize at the time was that this wasn’t going to be an isolated incident in this event. The other teams in the first two groups didn’t have any big lift issues but I know some of the guys didn’t look all that secure on some of them so us fans were all a bit antsy by the time they ended the first part of the pairs competition. We were hoping that the final two groups would make us feel a little less anxious but first, we had to get through the senior men’s short program (which was a schedule change from previous Nationals that I’m not a fan of and I hope they go back to the old schedule in 2020 for Greensboro). I’m actually going to keep talking about the pair event now and I’ll talk about the men’s and ice dance competitions later in this post. Anyway, after the men’s short program ended, we finally got to see the final two groups of senior pairs teams and this is where my anxiety level always goes up. I have SO many teams that I adore in the USA and I wanted all of them to skate well. The first of the contenders to skate was the team of Alexa Scimeca Knierim & Chris Knierim and my fears about the lifts continuing to be an issue was born out again when they missed not one, but two of them in their long program. I can’t remember the last time I saw them miss ONE lift, but two?! That was so shocking that we were all flabbergasted in the stands. Their program had beautiful choreography, but the errors really took away from the impact of it. They were really sweet after it was over though and it was wonderful to see that love and support between the two of them. I hope they have a much less emotionally draining season next year! Audrey Lu & Misha Mitrofanov and Jessica Calalang & Brian Johnson skated in the same group as the Knierims and while they didn’t have any big lift issues, there were a few moments where they made me nervous on their lifts as well. It was like a voodoo curse had been placed on these teams and that didn’t give me a great feeling. Their overall programs were wonderful though and I look forward to seeing what both of these teams do in upcoming seasons. The final group then took the ice and I cannot remember the last time I saw Haven Denney & Brandon Frazier skate as well as they did in their long program. They had some issues on their side-by-side jumps but their throws were great and thankfully, their lifts were solid. 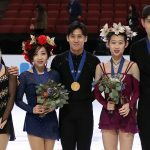 It was nice to see them skating well and being healthy again after dealing with Haven’s injury for so long. Deanna Stellato-Dudek & Nathan Bartholomay were the next team up and they skated an incredible long program. I don’t remember any big issues for them, but I really want them to skate ‘bigger’. They have all the elements, but I want them to fill the ice more with them if that makes sense. That said, I adore this team so much and I’m thrilled that they skated so well and hope they continue to improve together. Tarah Kayne & Danny O’Shea were next up (hello anxiety, LOL) and after a minor error on their opening side-by-side jumps (Tarah landed their 3S slightly off and wasn’t able to add the sequence very well), they were on their way to an outstanding long program, when disaster struck…ON A LIFT. Their very last lift, one I’ve long called their ‘money lift’ because it’s the one that they get the most points on, never went up due to a slight error on their timing and they lost 8-10 points on that one element. So that literally became the difference between being on the podium in first or second and ending up in fourth. Tarah was devastated, Danny was in shock, and I was completely dumbfounded in the crowd. I’ve never seen them miss a lift in a program. Years ago, back at a Skate Detroit summer competition, I remember Danny messing up the side-by-side spins once and telling me with a laugh later that ‘he really does know how to spin’. That’s what jumped into my head as I sat in the crowd that night. I couldn’t believe something fluky like that had happened to them and my heart hurt watching them in the Kiss and Cry. That is definitely not how they wanted their U.S. Championships to go this year. Having known them since the beginning of their partnership and being the webmaster for their official website, I can tell you they are two of the strongest people I know so I believe that they will use this experience and learn from it. It was just so sad and tough to watch from the crowd. The next team on the ice, Ashley Cain & Timothy LeDuc, were the one team that actually made me anxious about lifts but for a different reason. Remember that they had a bad fall on a lift during the free skate at Golden Spin of Zagreb in December. I was so nervous to see how they would recover from that having not competed their free skate since that event in December. They ended up skating an incredible long program and had no lift issues at all, so my heart went from devastated and sad to happy and relieved for Ashley and Tim. They obviously won the title overall with Denney and Frazier coming in second, Stellato-Dudek and Bartholomay coming in third, and Kayne and O’Shea ending up in fourth place. What a roller coaster of emotions I had going on through that last group of pairs! Looking back now, it might be a good thing that they broke up that event because had we gone through all of that emotional stuff and then had to sit through the ice dance final and men’s short program. I’m honestly not sure that I would have made it through without a lot of tears. One thing about Nationals is reconnecting with skating friends! I actually got to reconnect with a couple of friends that I hadn’t seen in a while at the arena between events. One friend I see at Nationals every year, but we hadn’t gotten a chance to talk yet since she was busy with other things and we just hadn’t connected at Little Caesar’s Arena yet. It was great to have a few moments to catch up and hopefully we’ll be able to hang out more in Montreal for Worlds next year (the next event we’ll both be at). The other friend I got to reconnect with, who actually lives in Canada, had come to Detroit to see the men and pair events. We finally got to chat in person after the pair event ended and it was SO great getting to talk with her in person. Her daughter used to skate for Canada and we had met each other at a summer competition years ago. Even though her daughter stopped skating years ago, we’ve always kept in touch and try to see each other from time to time (which has been challenging at times). She really enjoyed seeing the U.S. competitors that she rarely gets to see being in Canada and I’m SO glad we got to catch up over some gelato! Again, this is one of my favorite things about the U.S. Championships….catching up with fellow skating fan friends that I don’t get to talk to in person nearly enough. Now time to talk about the men! There were quite a few former junior men’s national champions skating in as senior men this year and I laughed at the fact that I think I was present when most of them won (I have been going to Nationals for a while now, LOL). I’m gonna have to talk about Nathan Chen first because his short program was nothing short of outstanding and it was so great to see him skate with confidence and passion. 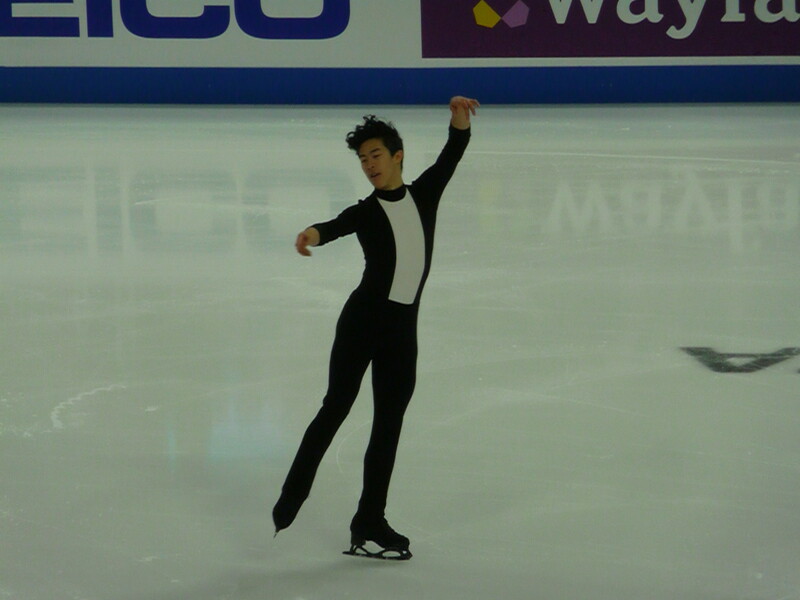 This is one of my favorite short programs for him, so it was a thrill so see him skate it so well. It was also exciting to see Jason Brown skate an amazing short program and although he didn’t do the quad in his short program, he did all his other jumps so easily and his personality and spins were top notch. I’ve loved his skating for a long time, so I’m glad to see him skating strong again. Vincent Zhou is another former junior champion who skated a strong short program, which was great to see since I know he’s struggled a bit this season. Tomoki Hiwatashi, Andrew Torgashev, Alex Krasnozhon and Camden Pulkinen are other former U.S. junior champions that skated very strong short programs in Detroit. It wasn’t the cleanest competition overall, but I loved how diverse and interesting the music choices were for most of the men. A few other skaters stood out to me in the short program competition: Jimmy Ma lit up the arena again with a fun performance; Timothy Dolensky is someone I always enjoy because his spins are outstanding and his skating style is so beautiful; Alex Johnson didn’t have the strongest technical moments in his program, but I always enjoy his style and presence on the ice and young William Hubbart caught my attention with his charming short program and I hope he keeps working on his technical skills because I loved his potential. The highlight of the night for me was seeing Sean Rabbitt skate what might have been the short program of his life after having more traveling woes than anyone else in the competition this week. He got me all choked up when he got emotional after his program and took in the standing ovation that he got from the crowd. What a sweet moment! Overall, I really enjoyed the men and was looking forward to seeing their long programs the next day. The final competition of the day was the senior ice dance final. Team USA is so stacked with ice dancers that we could literally send like seven teams to the World Championships and still put about four of them in the top ten. Reigning U.S. Champions Madison Hubbell & Zach Donohue skated a great free dance with no errors, but I have to admit that I really don’t care for this program for them. It feels generic to me and although they skated it very well, it just didn’t do anything emotionally for me. They ended up winning their second national title, but I’m pretty sure that didn’t come as a surprise to anyone since they’ve had such a strong overall season. Madison Chock & Evan Bates continued to impress me with their readiness and sharpness after her injury by skating a fun and energetic free dance that got the crowd involved right away. They ended up winning the silver medal and with more training time, I think they’ll definitely be ready to challenge for at least one of the top five spots at Worlds. I think they were my favorites in this overall dance competition and I’m so glad that they’re healthy again! Kaitlin Hawayek & Jean-Luc Baker won the bronze medal and skated an incredible free dance with no major errors. I’ve been a fan of this team for a while now and it was so great seeing them finally break through and make that podium. Lorraine McNamara & Quinn Carpenter came in fourth place and even though they don’t have the most energetic program this season, I love their free dance for its quiet complexity and their skating skills are just fantastic. I’m happy that they broke into the top four, which is tough to do in this strong field of teams. Christina Carriera & Anthony Ponomarenko ended up in fifth place overall after having a minor error in their free dance. I knew these placements would come down to errors and it’s a shame that they didn’t quite skate their cleanest program that night. They still have a bright future though and I fully expect all of these ‘younger’ teams to keep battling each other for placements. Rachel Parsons & Michael Parsons are another team that didn’t quite have the competition that they wanted when he fell in first set of twizzles. They were also debuting a new free dance set to Queen, which I think has potential, but probably needs a little more mileage. I found out later that they plan to keep this free dance for next season, so I look forward to seeing it again. I want to mention another team that really caught my attention and that was Karina Manta & Joseph Johnson. They skated their free dance to “Sweet Dreams” and really got the crowd involved with fun moves, great lifts, and awesome dancing. They were fabulous and I look forward to seeing more from them in the future! All in all, it was a fun day of competition although I have to admit that I was emotionally and physically drained by this point of the day because we’d been at the arena from 9:15 a.m. until almost 11 p.m. by that point. Thankfully, that was the only day we had a schedule like that! Yay for a much calmer schedule in Detroit! Day seven of my week in Detroit, the last day of competition, is coming up next and my schedule that day included the Friends of Figure Skating breakfast, the senior men’s final, dinner with friends at Kid Rock’s restaurant, and the exhibition of champions. Thanks once again for reading (especially this blog which I know was mad long) and I hope you’re enjoying my take on U.S. Championships this year!